As you may know, I love a good DIY. 1. Because it is so much fun when people compliment something and ask where I got it and I can say "Oh, I made it." <----- This doesn't exactly happen much, but it's fun when it actually does. 2. There is a sense of excitement when you make something for yourself instead of buying it. It's so Martha Stewart meets Laura Ingles Wilder. 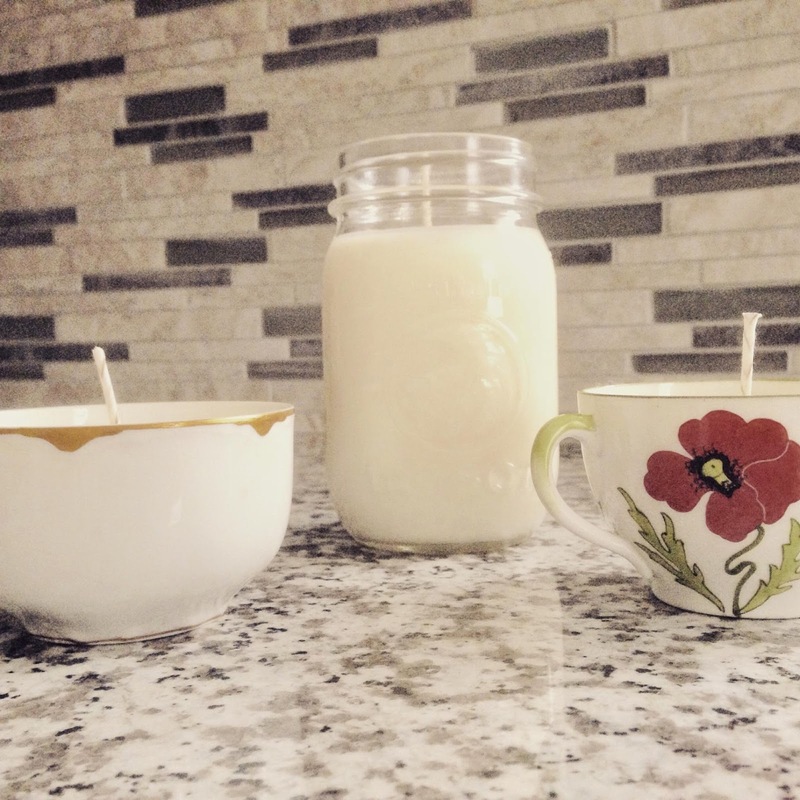 Making candles has been on my to-do list for quite a while, so I began researching on some blogs and found some great advice and resources. Like where to buy soy wax flakes. (about $15 on Amazon- see link.) Also, where to buy wicks. (About $9 on Amazon- see link.) But the #1 thing I learned is that making candles is easy done when you just do it--- you can drive yourself crazy researching and reading blog after blog about what temperature to add your fragrance, what temperature to pour into your container, what containers to use, etc. Just do it-- it's really incredibly simple and the only way to screw it up is to overthink it. 2. Wicks - these come in large quantities so save them for next time. 3. Containers -you can use anything and everything. I like Mason Jars and Tea cups, but next time I am hoping to venture into some fun tins. 4. Fragrance Oils - Yes, you can use essential oils, but I learned this can get very expensive. More details below. 5. Double Boiler- The wax comes off of the glass container very easily so don't be afraid to use a good piece of cookware. 6. Thermometer- more comments on this below. 7. Hot Glue Gun or a substitute to keep the wicks stuck to be bottom of the container. 8. Shishkabob sticks or something similar. Put about 2 lbs of wax in your double boiler. Stir until it melts and is completely clear. Once it is clear, remove from the double boiler with a potholder. Let it sit and cool. (Now, my research says that it needs to be 120 degrees before you add the oils, Other research says 160 degrees. Im 99% sure my thermometer didn't even work properly, so I just used my own judgement and once it started to not look 100% clear, I added the oils. **While it is cooling, get your containers ready. Put a dab of hot glue on the bottom of the wick. Set it in the middle of the bottom of the container. Put shiskabob sticks on either side of the wicks and tape them together to keep it stable. After you mix in your oils, pour into your containers. Let sit 8-12 hours until completely solid. Again, I am not a fan at all of soy in my diet, but with candles, it is fabulous. Soy wax is such a clean burn. They don't create the smoke like other waxes. It is naturally a beautiful beige color so it matches everything. This was a really fun DIY project and super easy. My number one advice would be to keep it simple. That's all, folks. Light em up and happy burning.